When you are seeking a French theme wedding favor, this votive candle has a French flair that will look "tres magnifique" on your reception tables! 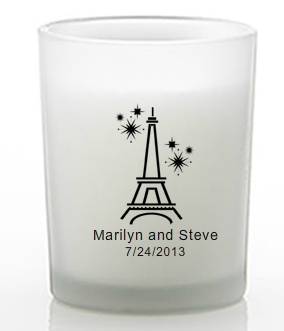 They can also serve as festive Eiffel Tower wedding favors when you send them home with your guests - a royal wedding style gift. Each favor measures 2.5" tall x 2" in diameter, in a classic shot glass/votive holder shape. 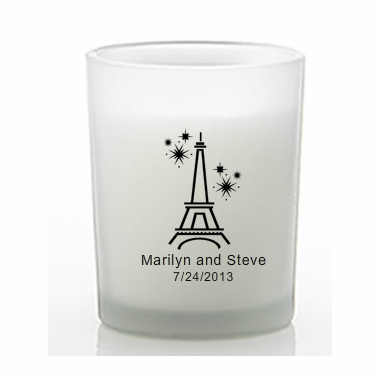 Each is made of frosted white glass with a poured white candle inside. They are perfectly fitted to be silk screened with amazing accuracy directly on the glass.